Hotmail in IE - Use Internet Explorer for WLM’s Hotmail Features. 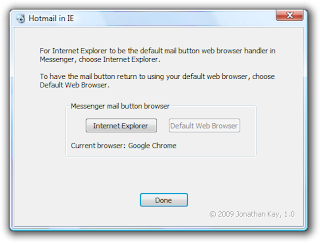 Prior to Windows Live Messenger 2009, when you clicked the Mail button in Messenger, Internet Explorer (IE) would automatically pop up and log you into Hotmail regardless of your default browser. Beginning with WLM 2009, clicking the Mail button will open Hotmail in your default browser and if that is not IE, it will not provide the automatic log-on into Hotmail.